Since we moved in our new house I have been looking for pictures to decorate the two niches we have. I cannot find anything I love to put in them, because everything seems so impersonal. 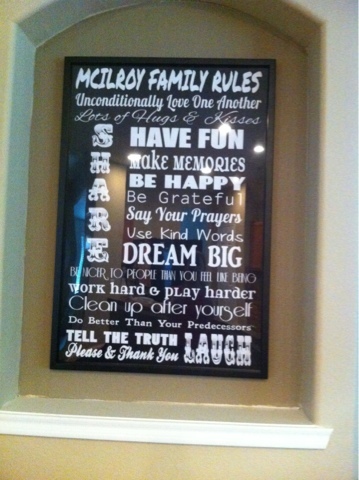 I was at my friend Natalie's house one day and she had just hung a small 'Family Rules' framed photograph she found at the store. Her decorating skills were my inspiration for my latest crafting attempt. 2. Go to word and write whatever it is you want to have framed and try out the various fonts to figure out the look you like. 3. I tried to do my final layout in Photoshop, but I am not smart enough to figure it out, so I used a sample of a program called Scrapbook Max 2.0. The problem with the sample is that when you print the bottom eighth of the page is watermarked. I just shrank my picture, saved it, and cropped it to the 2'x3' dimensions I needed. (The program is very reasonably priced if you plan on making numerous projects). 4. I went to Office Depot and they printed my black and white poster for $3! I am very excited about my newest framed art in the house. I live that it's a touch of my personality show cased. Not too bad for someone who isn't very artistic or crafty.